The most effective intent-based marketing approaches consider both first-party data sources as well as data from third-party providers. The integrated data provides a holistic picture of consumer intent across all web activities, not just interactions on the company’s owned platforms. Using an intent-data-driven approach, companies can deliver custom campaigns, recommendations and ads to individual B2B users. 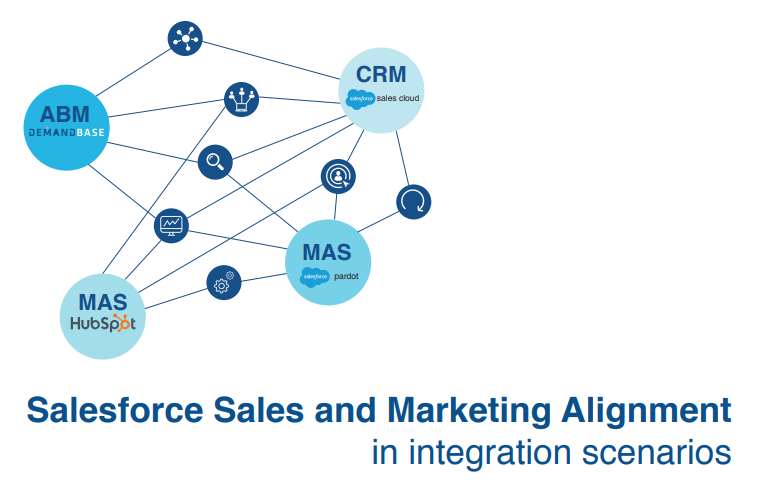 When paired with marketing tools like Salesforce and Hubspot, marketers can leverage automation, personalization and other systems to streamline their activities. This highly targeted approach improves the effectiveness and efficiency of marketing processes, thereby increasing ROI. What is “user intent” and why does it matter? The term “user intent” describes the identification and categorization of the next action an online user is likely to take. While it was first used in the SEO world for describing what a user intends when typing in a search bar, it quickly expanded to B2C and, recently, B2B marketing spaces. 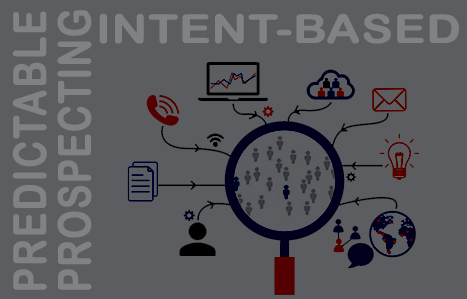 As a lead generation tool, user intent can be more powerful than predictive prospecting alone. With intent data, marketers can reliably determine when an online user is in the process of making a purchasing decision. This creates an opportunity to deliver marketing messages at the exact right moment to positively influence the purchase decision. With proper intent monitoring, a company can determine what a prospective B2B customer is likely to do next. When intent data is combined with historical information like websites visited and read or downloaded content, marketers get a clear view of the consumer, despite the fact that a transaction hasn’t even occurred yet. This data can be consolidated, cleansed and aggregated to produce an ideal consumer profile, which is the basis for determining user intent. With the rapid growth of technology and big data, marketing techniques based on user intent have quickly evolved. With marketers focused on increasing ROI by improving conversion rates as efficiently as possible, intent based marketing practices have become widely adopted in B2B marketplaces. Surveys have shown that more than of 80% of today’s B2B CMOs are investing in technology to retrieve and leverage buyer intent data. Incorporating B2B user intent into marketing strategies can have a positive impact on ROI by enabling the team to focus their efforts on the most profitable activities. 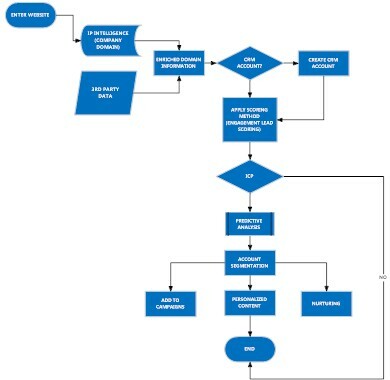 A clear B2B customer profile based on intent data—demographics, online search activity, social media interactions and more—combined with activity monitoring takes the guesswork out of planning marketing and sales promotions by identifying ideal customers and signaling when they appear to be in the process of making a purchasing decision. With qualified intent data, marketers can identify the most promising leads, better prioritize them and develop targeted campaigns that are more likely to convert at the exact moment they’re making a purchase. Purposeful, data-driven prospecting strategies improve the efficiency of the team’s activities, drive down the costs associated with their programs, and increase the return. 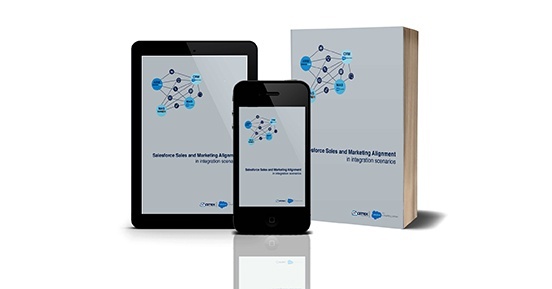 With validated results, marketers can demonstrate the value of their intent-based marketing programs and generate buy-in from the organization. Intent data comes from the digital footprint left behind by a B2B consumer during a website visit. It may include keywords in a search engine, clicks on particular web links, and social platform interactions. 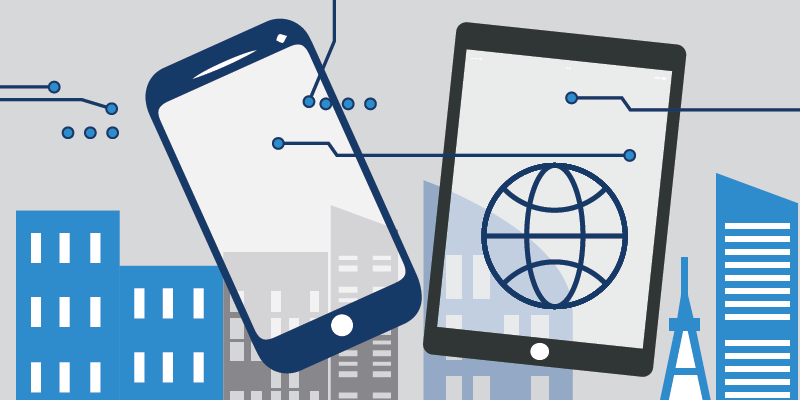 First-party—or internal data—are data coming from internal, customer-facing platforms like ERPs, CRMs or websites. They are cost-free and generally accurate since they include only historical information. Only limited user intent information can be derived from first-party data. Second-party data is another company’s first-party data. This data are not cost-free and, like first-party data, provide limited information on user intent. Third-party data come from external sources, including electronic publishers and ad exchange marketplaces. These data are collected, cleansed and analyzed by third-party data providers. They are not cost-free, but since the data cover 93% of the entire web, they provide access to large cross-industry volumes of information. Third-party data are generated and collected by a variety of platforms and websites. Since they have a wide range of coverage, they can be used to build comprehensive and reliable profiles with user behaviors. These profiles are used by marketers to segment their users or prospect pools and then to target and tailor advertisements and other promotional services. The user is anonymous. Either there is no ERP or CRM account or the user is not logged in. (IP intelligence and other demographic information are considered to be third-party data). The user is known, but in the past he/she purchased mobile phones on this website. For the anonymous user, user intent would be based only on current site activity and, therefore, only content and recommendations about printers would be delivered. For the known user, user intent would be based on historical information (mobile phones) plus the current site activity. The delivered content would include mostly mobile phones, but also some printers. For the anonymous user, user intent would be based on demographics and/or IP intelligence. In some cases, a complete user profile may be available. Then, content would be based on the profile plus the current site activity. Content would not only include topics of current interest (printers), but also customized messaging based on the user’s profile, considering things like average dollars spent, similar or close products, etc. For the known user, user intent would also be based on the profile found in third-party data. Again, highly customized content would be delivered. When data for many user accounts are collected and analyzed, similarities and groupings can be discovered. With this kind of in-depth knowledge of its target audience’s behavior, a B2B marketer would know what is expected from the user who usually buys mobile phones and is now looking for printers, allowing them to more effectively apply marketing strategies to convert that user. 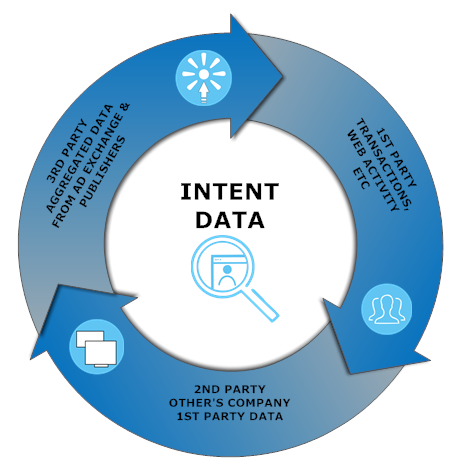 Intent data—derived from first- and third-party data together—is used throughout the entire marketing process. Third-party data providers enrich company domain information and supply ready-to-use B2B consumer profiles and behaviors. Predictive analysis modules model the company’s customer pool and form an ideal customer profile. This data-driven model is continuously fed with data and constantly updated and evaluated. Subsequent B2B users are compared and ranked against the ideal customer profile, with qualified users receiving tailor-made promotional services. Personalized marketing services, like content, campaigns and advertisements, are offered to the user based on model comparison results and segmentation. 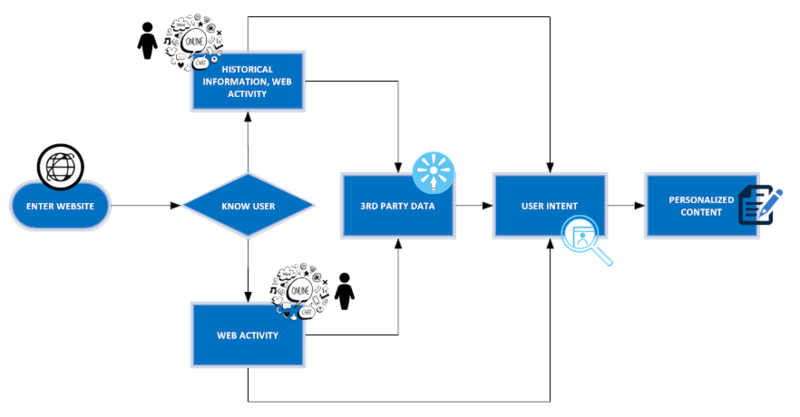 As shown in Figure 4 above, third-party data is the cornerstone for retrieving user intent. Then, retrieving user intent is the cornerstone for leveraging marketing techniques that enhance the B2B user experience throughout the entire customer journey and, ultimately, increase conversion rates at the maximum ROI. Is intent marketing a predictive analysis tool? Intent marketing is a predictive analysis tool in the sense that retrieving user intent enables marketers to predict the likely next action. But, there are important differences in the two approaches. Predictive analysis uses historical data to determine the next likely action. User intent then, would depend on past behavior. With historical data, a behavioral change cannot be accurately predicted using predictive analysis. If someone is looking for printers now, but was looking for mobile phones in the past, recommendations will still focus on mobile phones. While it continues to become more feasible, analyzing such large amounts of data remains a complicated process that requires sophisticated knowledge and processing power. 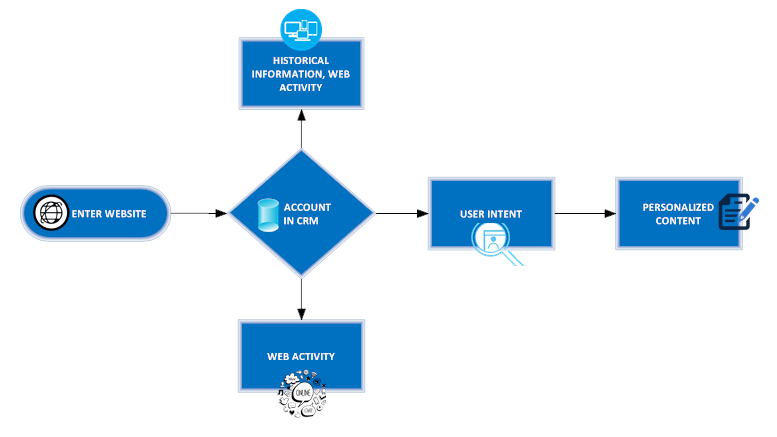 Retrieving and analyzing intent data is a much simpler process. By capturing online activity as it happens, we can tell exactly what the user is looking for without the need for complex algorithms. 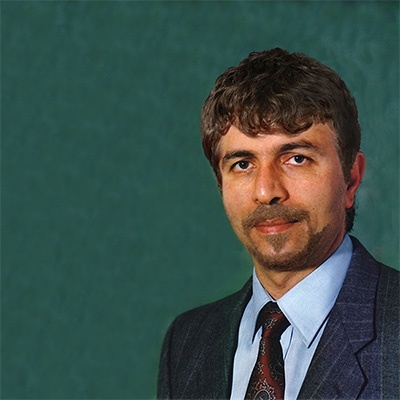 It does not require a large database, multiple platform integrations, processing power, or data consolidation and cleansing techniques. 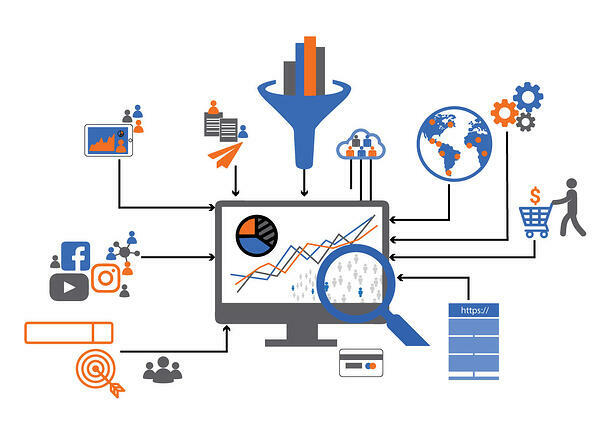 While intent data analysis is easy to use, it does not depend on past data, which means it requires strategic follow-ups, campaigns or other promotional actions, plans and updates to continue producing reliable predictions. Once user intent is established, it’s easy to incorporate buyer insights into prospecting processes. With smart systems that take advantage of modern marketing techniques and automate marketing processes, companies can create faster and more effective marketing processes that are easily adjusted based on customer insights. This delivers improvements in ROI, increased pipeline growth and better conversion rates. By segmenting prospects based on user intent, and by using advanced marketing tools, certain tasks like advertising emails can be automated, reducing time spent by marketers. Depending on data available, the process may be customized for the B2B user. Marketing automation tools like Salesforce Pardot use such features. An intelligent system like recommender engines can use intent to make recommendations and, therefore, drive a prospect to complete the journey faster. Content management systems, interfaced with CRM systems can deliver personalized content, like advertising and other content delivered by Hubspot and Salesforce engines. Using intent and scoring models based on predictive analysis tools, prospects can be prioritized through the entire customer journey. Marketers can then focus on the most promising prospects and be more efficient and productive. Having applied scoring systems, marketers are able to apply more effective persona-based marketing techniques. Marketing based on B2B user activity and intent is a relatively new and quickly evolving tool for improving conversion rates, growing a qualified pipeline, and maximizing ROI. By leveraging third-party data, marketers can form a cross-industry and cross-marketplace B2B user profile, which is the basis for accurately predicting user intent and influencing the customer’s purchase decision. With intent data, marketers can effectively get inside B2B users’ minds to learn what they actually need and are looking for in real time. Then, they can offer personalized marketing services, like emails, campaigns and promotions, to guide the user through the entire customer journey.